The idea that a small, rag-tag team of dreamers can out-innovate and and out-execute mega-funded billion dollar corporations sounds like something plucked right out of a fairy tale. But the truth is, it does happen. Every day new ideas are being formed and new companies are being launched. For every success story however, there are hundreds of stories of bitter failure. Given the odds, you might be tempted to think these successful founders are just lucky. Maybe they just picked the right market at the right time and everything else fell into place. While it's true that some businesses do get lucky, no business stays lucky. Starting a company in the early stages is all about achieving traction as quickly as possible while minimizing the risk of going under. And to achieve this goal, you don't need luck. You need a proven, repeatable process that with enough hard work, can generate results for anyone. This guide is exactly that. Written below you won't find magical shortcuts or silver bullets. What you will find however, is a practical, step by step outline that nearly anyone can use to start and grow a business from 0 to $10,000 in monthly recurring revenue(MRR). This guide doesn't require any particularly amazing skillset or genius intellect. You just need to do the hard work. Below is the hard work, proven way, to launch a B2B startup from $0 to $10k/MRR. Well, a number of reasons. First, it's a very achievable goal for nearly anyone. If you're willing to put in the hard work and truly follow the steps outlined below, there's a very good chance you'll get there. Second, it's a meaningful goal. At $10k a month you're not flying around on your private jet and chances are you're not even covering your own expenses after payroll, but it means you're onto something. Something that can be nursed and grown into a real, successful company. The best way to master a new field is to first break down the field into various components to master individually. Once this model is broken down, you can identify where your current knowledge gaps exist and begin tackling them piece by piece. This method not only allows for more systematic learning which produces more consistent results, but mentally provides you with a more gratifying progression to follow that will lead to more dedicated studying and implementation of what you've learned. Nothing will burn you out faster than trying to conquer Rome on your first day. So before we dive into how to build and scale a B2B startup to $10k MRR, we'll first need a model to study. From start to finish, I've outlined the steps you'll be taking to launch your new company. Working through the process is simple. When you successfully complete one step, move to the next. If you fail at a particular step for whatever reason, move to a previous step with your new knowledge and start over. I want to emphasize that there is no TRUE failure in this model except for giving up. There are only lessons learned, tight knit feedback loops, and success waiting at the end of the model. In reality you will likely have many more loops and resets than the chart given above. Don't let them discourage you, or feel that it is anything out of the ordinary. 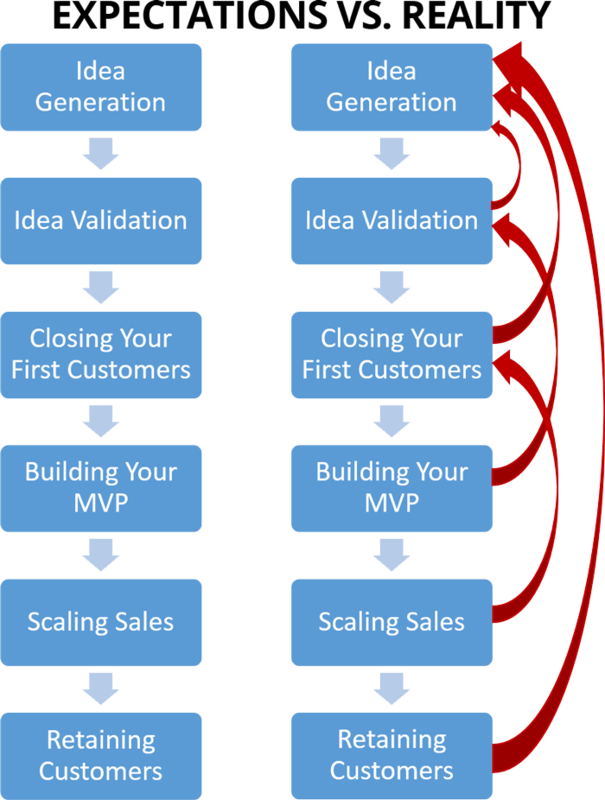 The Lean Startup model measures a company's success on the number of feedback loops they can fit into their current runway. While I don't entirely agree with this philosophy, the underlying message remains clear. Testing assumptions, learning from them, and forming new ideas is a continuous process that is to be expected and embraced. ...continued in Part 2 - Idea Generation.